Tomorrow the 17th Belgian VMUG Meeting will take place in Diegem, Belgium. Erik Schils, the leader for VMUG Belgium, has managed to organize a full conference day. More than 150 people will attend: Most attendees are from Belgium, but there’s also a big delegation from The Netherlands. This Belgian VMUG Meeting is called “The Blogger Edition” because most of the sessions in the agenda are presented by bloggers from Belgium and The Netherlands. Eric has managed to compose a very compelling agenda featuring speakers a.o. Luc Dekens, Gert van Gorp, Erik Scholten, Sven Huisman, Duncan Epping, Frank Denneman and Eric Sloof. I will also present at this VMUG meeting and talk about VMware vCloud Director. My session is called “Unleash the IaaS Cloud: About VMware vCloud Director and more…”. My presentation will start with an introduction to IAAS: Infrastructure as a Service. 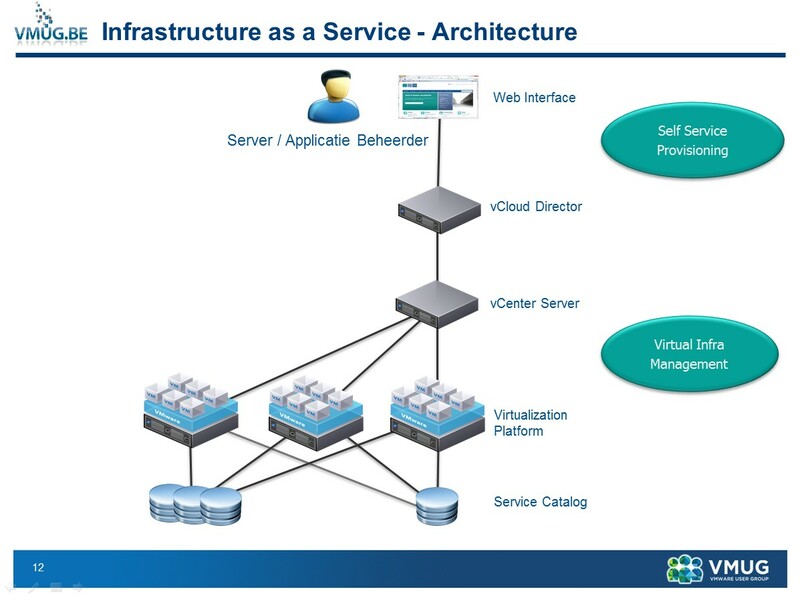 After that I will explain what the role is of VMware vCloud Director (vCD) within IAAS. I will discuss the architecture and some of the key features of vCD. The relationship between vCD and VMware vSphere will also be explained The presentation will include a demo if technology permits to logon to the remote lab ;). Hope to see you tomorrow at the Belgian VMUG meeting!